Here you can find comprehensive information about our sustainable, innovative products and services for metal roof and wall systems, sandwich panels, profiled cladding and flashings. With our products you can enable beautiful, durable, modern and high quality industrial buildings, sports complexes, offices and residential homes. Sab-profiel is closed on Good Friday and Easter Monday. Happy Easter. 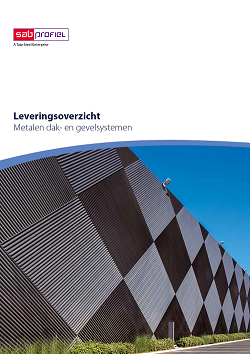 SAB-profiel: the largest supplier (in the Netherlands) of sandwich panels, profiled cladding and flashings. All tailor-made for your construction project everywhere in Europe and the rest of the world. For the best metal roof and wall systems and other solutions in steel, SAB is your partner. Through years of experience with sandwich panels, roof panels, wall panels, profiled cladding, liner trays, roofing plates and flashings we can guarantee quality. Consult this website for technical details, project references, Colorcoat® products and to download practical information, such as brochures, colourcards, CE-declaration and Auto-CAD drawings. Top of this page you will find a handy search tool to find the information you are looking for.